The eyes of the whisky world turn to one of its most isolated outposts this week, when the three remaining Campbeltown distilleries join forces to hold the fourth Campbeltown Malts Festival. As ‘Whisky City’ enjoys a new phase of renewal and optimism, Richard Woodard casts an eye back over its chequered history. The words of the inimitable Michael Jackson, written more than a decade ago in Whisky, have the air of obituary or requiem. But even then, the scent of fresh hope was in the air: Glengyle had recently been resurrected, and stalwart Springbank and Glen Scotia remained in operation, reminders of Campbeltown’s proud past. It’s tempting to characterise the story of Campbeltown and whisky as one of rise and fall, but the truth is far more complicated: more rise, fall, rise, fall and rise again. It’s a story that permeates the town: its buildings, its historic prosperity, the waters that all but surround it. Let’s start not at the beginning, but with Alfred Barnard. 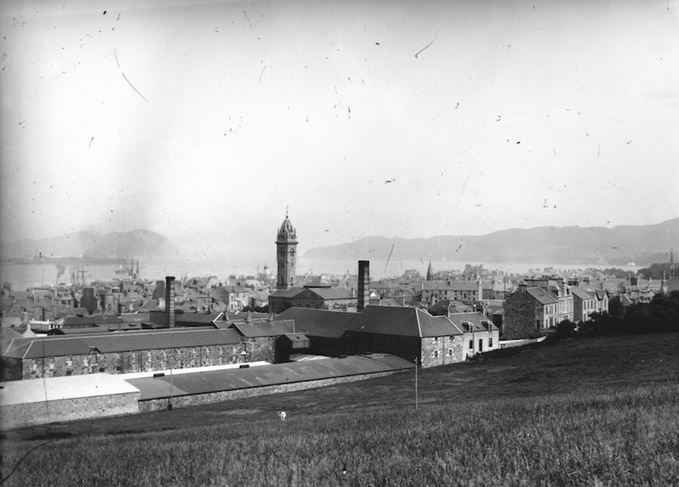 The author of The Whisky Distilleries of the United Kingdom visited Campbeltown in 1885, when it was at or near the peak of its powers; from this high vantage point, we can look both back and forward. Modern Campbeltown is a place of three distilleries but, when Barnard came to call, there were no fewer than 21, all but one of them within the town, collectively producing almost 2m gallons of spirit a year. Barnard and his travelling companions booked into the town’s White Hart Hotel for two weeks to complete their researches. The picture that emerges is one of prosperity, and not just in whisky: the latter days of the 19th-century herring boom were still in evidence, from the ground thick with fishing nets laid out to dry, to the ‘many hardy fish women, with sunburnt faces, selling fresh herrings which glistened like silver in the sunshine’. The harbour’s waters, meanwhile, were ‘teeming with life and hundreds of sail were riding safely at anchor on its ample bosom’. Distillery accounts ring with investment and modernity. Hazelburn is capable of producing 250,000 gallons of spirit a year on its own; Dalintober’s warehouses are being extended; there’s a new kiln furnace and what is billed as the largest malt barn in Campbeltown at Benmore. Dalaruan, Kinloch and Scotia have all recently been enlarged, while Glenside has undergone many improvements. Barely 40 years later, only (Glen) Scotia would remain, but for the moment all was optimism. Campbeltown then was to Scotch whisky what Epernay was to Champagne, the street of Longrow its Avenue de Champagne, although with more humble architecture. The villas on the east side of the bay bear testament to the wealth that whisky brought and, just a few years after Barnard’s stay, Campbeltown was said to have the highest income per capita in the UK. Before we try to assess what went wrong, let’s look at what went right for the place Barnard variously described as ‘Whisky City’, ‘Whisky Land’ and ‘Spiritual Town’ (in more than one sense: there were many places of worship, and the Sabbath was strictly observed). Location was the chief factor at play. Proximity to Ireland brought expertise in distillation, while the fertile fields of Kintyre, the waters of the nearby Crosshill Loch and coal from the Drumlemble mine near Machrihanish provided the raw materials. Long before Barnard’s visit, Campbeltown was a hotbed of illicit distillation, with an estimated 31 illegal stills operating by the end of the 18th century. As in many other parts of Scotland, the 1823 Excise Act simply turned an illegal whisky boom into a legal one. But chief among these attributes was Campbeltown’s maritime location, and its superlative natural harbour. Now thought of as isolated at the end of an apparently never-ending stretch of the A83 road, the town was then anything but, thanks mainly to the age of the steamship. As Campbeltown’s whisky industry grew, steam brought in the peat from the Hebrides and the barley from Ireland and south-west Scotland – even, at one point, from the Baltic; and steam took the whisky back out again, to the fast-growing market of Glasgow and Clydeside, to London and the world beyond. Steam also sent out émigrés, who went in search of a better life and took word of Campbeltown’s whiskies to the brave new world of North America. But it would be wrong to think of the 19th century as one long upward curve for Campbeltown and whisky: the slump of the early Victorian years led to the closure of more than a dozen distilleries in the town – a precursor of the more dramatic cull that was to come almost a century later. Not everyone thrived in the late Victorian days either. Meadowburn was closed by 1886 – but had presumably ceased production by 1885, as Barnard doesn’t mention it – and Longrow shut down a decade later. But the rest of Campbeltown’s redoubtable roster of stills ticked on well into the 20th century, even surviving the enforced closures of the First World War – before almost complete collapse shortly afterwards. No fewer than 17 distilleries closed in the 1920s and, by the end of the decade, only Rieclachan was still distilling. By 1934, the twin survivors of Springbank and Glen Scotia had restarted production – but Rieclachan had shut for good. There are almost as many theories to explain Campbeltown’s demise as there are accounts of those days. Most likely it was a combination of the general malaise afflicting the entire Scotch whisky industry with circumstances particular to Campbeltown: in negative image, a perfect storm similar to the one that raised the town up in the first place. Take your pick from these factors: the closure of Drumlemble coal mine in 1923; post-WWI duty hikes; the teeming effluent that turned Campbeltown Loch into a filthy ecological nightmare; Prohibition. Then there’s the whisky itself. Famously smoky, oily and pungent, this was now out of step with the blender’s call for something altogether lighter – which may be one reason why Springbank, reputedly fresher than many of its neighbours, survived the cull. Declining sales led to lower prices, so distillers began to cut corners to save money, running the stills harder and creating a vicious circle of falling demand, value and quality. In another seminal work published in 1930, Whisky, Aeneas MacDonald laments the passing out of fashion of Campbeltown, listing 10 active distilleries, but observing that, until recently, 17 had been in operation. It’s a cruel twist that, by the time of the book’s publication, MacDonald’s information was out of date; of the 10 distilleries he names, only Springbank, (Glen) Scotia and Rieclachan were still going (and two of those had temporarily ceased production). Luckily, remain they did, even if by the very skin of their teeth. Those lone sentinels of Springbank and Glen Scotia soldiered on for several more decades, lately supplemented by a restored Glengyle – not to mention the ghosts of Hazelburn and Longrow, which live on in the respectively triple-distilled and heavily peated variants produced by Springbank. While it may never again scale the heights of its late Victorian boom, Campbeltown’s whisky industry is vibrant once more, as this week’s Campbeltown Malts Festival will celebrate. The event includes a series of tastings, masterclasses and dinners, plus opportunities to walk to Crosshill Loch and to discover the town’s distilling history in all its rich diversity. A history that, for all the rollercoaster contortions of the past 200 years and more, simply refuses to die. 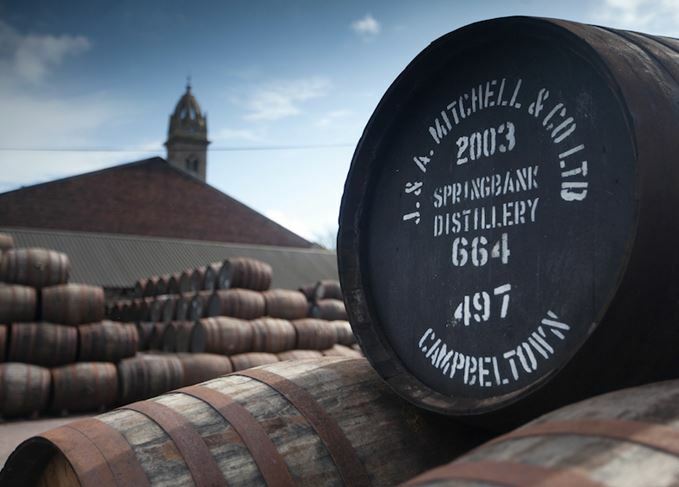 Further details of the Campbeltown Malts Festival via the Springbank website. Springbank, Glengyle and Glen Scotia put on a show for visitors to the remote ‘Whiskyopolis’. Campbeltown’s rich history encompasses herring fishing, coal mining and – most famously – whisky. Delayed, but worth the wait, as Becky Paskin reviews Campbeltown’s festival editions. The Campbeltown distillery is going on a Grand Tour of the world, starting with the UK. The new £250 expression was launched at this week’s Campbeltown Malts Festival.